The E259 Series is a limited express-type electric multiple unit developed by JR East to replace the 253 Series on the Narita Express route. The Narita Express has been an important route for JR East since its introduction in 1991, but by the late 2000s, the 253 Series trains used on this route were beginning to show their age. 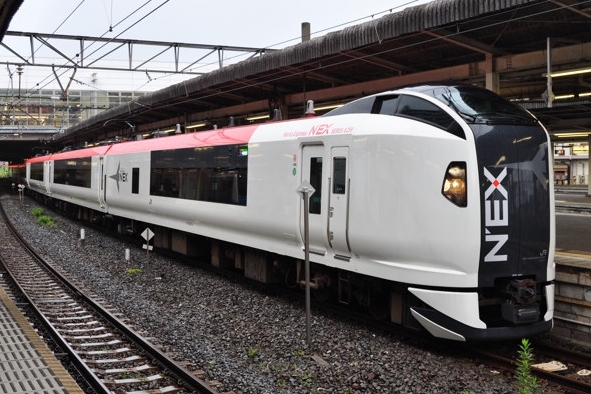 With the Keisei Corporation opening a new airport access line and building a new limited express to operate on it, JR East decided it was time to replace its aging rolling stock. The result was the E259 Series, a new design that carried over many of the features of the 253 Series, but introduced an entirely new body with an elevated driver's cab. The white, red and black color scheme of the original Narita Express was kept. The design shares many features with other JR East designs such as the E653 Series and E257 Series and is constructed of aluminum alloy. End cars have walk-through doors to make access easier when two formations are combined. Due to its role as a airport access train, the E259 Series has plentiful space for luggage in the areas between cars. It is also equipped with wireless LAN to assist its business users.